Imagine being a good golfer. A really good golfer, one with a plus handicap. Now imagine having the opportunity to accomplish something the great Ben Hogan did in his storied career. It sounds like something in a dream. For Western New York professional golfer Bill Gaffney, that dream become reality this week. 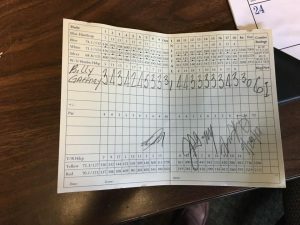 On Wednesday, September 20, Gaffney chased down the 69 year old course record at Brookfield CC in Clarence, first set by Ben Hogan in 1948. The score he was chasing was 64, but he obliterated it by three strokes, finishing with a sizzling 61! A day later, with his feet back on the ground, Gaffney was very humble about the accomplishment. BSP– How did you feel before the round, meaning, did you have the feeling you were in for a good day? BG-. Before the round I had gone out to Crag Burn to pick something up. Then my dad called and said he wanted to play at his course. So I got in the car and drove over there. When I got there he said we were on the tee so I walked from the car right to the tee and pegged it. So I really didn’t have expectations prior to the round. I didn’t really start to feel like I was going to do it until the eagle on 13. That made it game on. BSP– Was your routine any different than normal? BG– I guess my routine was very different because I didn’t warm up! But really, I try to play every round like it counts, so every shot and club selection was as if I was playing a competitive round. BSP– Were you aware of the course record? Had you been close before? BG- I was very aware of the course record. I’ve been trying to beat it since I was a little boy. Not for the fact that it was the course record, but because of the gentleman who held it. Mr. Hogan is an Icon and a legend. To beat the record he had set in 1948, 69 years later, was a complete honor. I cherish the fact that it was his record, it really makes this one more meaningful than ever. The week previous I had shot 65 three times. I knew I was close, I knew I could beat it, I didn’t EVER think I would beat it by 3 strokes. BSP– At what point during the round did you know you had a chance? BG– To try and be as humble as possible, I always knew I could break it. Golf does have a good bit of luck involved. It just so happened I had a very good day and luck was on my side. I got some good breaks and hit some very good shots. My putting has been fantastic all year, but my clutch putting has really gotten good the last few weeks. But on 13 when I made eagle, that really put the hammer down. It put me at -7 which I knew I had at least a birdie on the next par 5 (16th hole). I work with Corrine Matthews, a hypnotist here in buffalo. Our last session we did was about keeping the hammer down and staying in that zone. Well there you have it. That was truly the time I stayed in the zone for an entire round. Some say hypnotism is a joke. I’m telling you it has helped me beyond more than any book you can read. BSP– Was there a shot that stands out that “rescued” the round? BG– Without a doubt the putts to save par on 10 and 12 were HUGE. They were both difficult 12 foot putts that had quite a bit of break. Both went right in the center. The work I have put into the putting this year has paid off tremendously. It’s such an important part of getting to the next level. BSP– Who were you playing with and did anyone in the group mention the record? BG– I was playing with my dad and Steve Schopp. Having my dad present makes this moment all the more special. Honestly they were great, they were hitting and picking up just to keep us moving and stay out of the way. They kept the good vibes and Steve was very encouraging and making sure I took my time and focused. Sharing this moment with my dad is just amazing. He had been trying to break the record for 45 years, the closest he had was 65, so I think this hits home for him as well. BSP– When you holed the last putt for 61, what’s the first thought that came to your mind? BG-First thought… I think I said wow I did it. This is so cool. I really wish Mr. Hogan was alive so I could thank him for giving me something to chase for all those years. It made me such a better player. BSP– How does it feel to hold the course record at Brookfield, surpassing the great Ben Hogan? BG- It’s very surreal. Obviously holding the course record at the course I grew up on is a great accomplishment. I’m proud of it. But beating Mr. Hogans record, that’s something that is far more exciting to me. I hope to one day accomplish very many great things in this game, but I don’t think anything will amount to Mr. Hogans everlasting impact on this game. He’s a legend, and to share this moment is a blessing. BG– I do play the OnCore Elixir. It makes it really cool, because this is where it all started. The ball, me, Brookfield. I couldn’t ask for better supporters and sponsors. Being part of Team OnCore and part of the OnCore family is the best. And I get a lot of questions about the ball and why I play it. And the fact of the matter is that the ELIXIR is the best ball I have ever played. It’s just a phenomenal golf ball, and the guys who run the company are even better. The most important thing I think is to thank the people who helped get me here. And if there is a way to include these please, please include it. There is no way I could have been at this level and done this without these people. 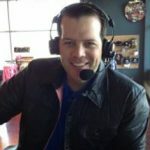 Steven Truitt from Lone Star Mat, OnCore Golf, my coaches Joran Meeks, Gary Battistoni and Mark Kirk, my hypnotist and mental game guru Corrine Matthews, Donald Ross Sportswear, my girlfriend Taylor who I was texting with updates on my round and kept responding “you can do better”, and my family. Especially my dad. Another special moment could be on the horizon for Gaffney. Earlier this month, he qualified for the first stage of the Web.com Tour in Dallas. The challenging test of golf begins October 10th. It’s fair to say Gaffney is playing some of his best golf, and he’ll put it to the test, perhaps fittingly, not too far from Hogan’s Alley in Fort Worth, Texas.